Toyota Kirloskar Motor will soon update the base grades of the Toyota Etios sedan in India. These updates will have a focus on enhancing only the interior of the entry-level equipment lines. 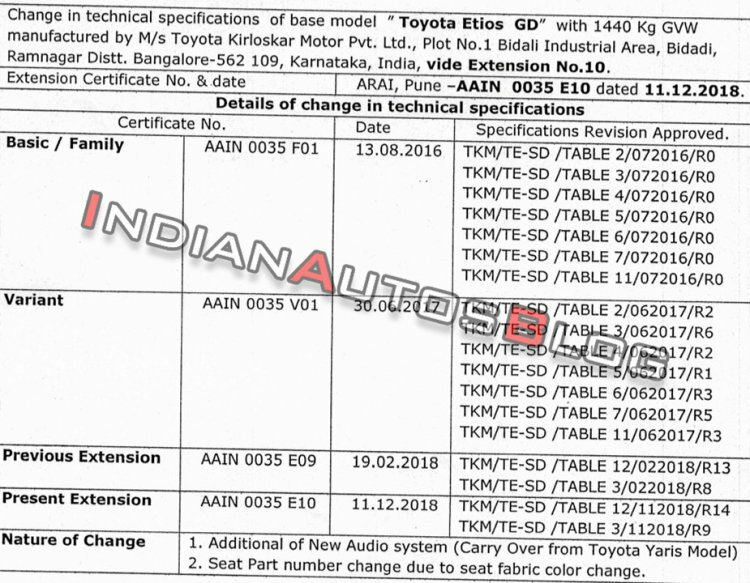 TKM will revise the entry-level G and GD grades of the Toyota Etios sedan. TKM sells the Etios petrol in G, V and VX grades and the Etios diesel in GD, VD and VXD grades. It will soon revise the entry-level G and GD grades. Both these grades will gain a basic audio system, the same unit the company offers in the J grade of the Yaris. Connectivity options of this system include CD MP3, AM/FM, USB, Aux-in and Bluetooth. Dual-tone interior in a combination of Black and Ivory is standard in the Toyota Etios currently. With the MY2019 update, the G and GD grades will get the fabric seats in a new colour. Mechanically, the sedan will remain as is. There are two engine options to select from: 1.5-litre petrol and 1.4-litre diesel. The petrol engine produces 90 PS at 5,600 rpm and 132 Nm of torque at 3,000 rpm. The diesel engine develops 68 PS at 3,800 rpm and 170 Nm of torque at 1,800-2,400 rpm. A 5-speed manual transmission is standard. The fuel economy rating of the sedan is 16.78 km/l (petrol)/23.59 km/l (diesel). With the MY2019 update, the Toyota Etios sedan will get the audio system of the Toyota Yaris' J grade and fabric seats in a new colour. The Toyota Etios in both hatchback (Liva) and sedan (Platinum) versions is likely in the last full year of sales. It is in a dying need of a complete makeover now, and so, a BSVI upgrade in the current form is unlikely. By March 2019, it should have taken an exit from our market.